FORMER MDC official Eddie Cross has triggered a storm following reports that he supported President Emmerson Mnangagwa’s penchant for flying in luxurious jets. Opinion is sharply divided over Mnangagwa’s costly foreign trips at a time the country is mourning the death of over 300 Cyclone Idai victims. In the midst of efforts to locate missing persons in Chimanimani, Mnangagwa left for a day’s visit to Angola last week. From Angola, he headed to South Africa for yet another official visit. But what infuriated his friends and foe alike was his decision to hire a luxury jet from Dubai to attend a meeting with the civic society in Bulawayo. According to reports, the Airbus A318-100 flew seven hours and 16 minutes from Dubai to position in Harare, ahead of Mnangagwa’s flight from Harare to the second city. 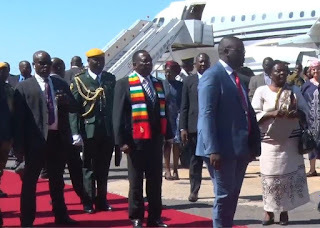 An influential figure in the country, Cross told ZBC TV that “all trips by the president are very significant and essential, the spin by the independent press that the president’s trips are gobbling the fiscus are unfortunate. Look, some of these missions are planned well six months before. The president has a diplomatic and political obligation to fulfil international mutual agreements, so all his trips are justified”. He went on to say that “the president should travel comfortably and on time so this issue of a hired jet, some are hired by his counterparts so it’s not fiscus money always, more so it is important like what happened when he had to trips to Russia and the UAE (United Arab Emirates) with the jet, it was fast for him to come back and attend to Cyclone Idai”. In the wake of the ZBC report, MDC’s David Coltart took to social media yesterday, connoting that the former MDC legislator had probably been misquoted. “The ZBC has posted that Eddie Cross says that Mnangagwa’s foreign trips on luxury aircraft and his hiring of aircraft from Dubai to fly to Bulawayo is justified. I presume that if he has been misquoted, he will refute this story,” he wrote. Contacted for comment by the Daily News yesterday, Cross insisted that there was nothing sinister about Mnangagwa’s flight to Bulawayo. “I believe it was justified because it was made available to him by the sultan of the UAE for a week; the special jet was made available for the President’s disposal for a week. That’s what I believe,” he said. Leader of Gwanda Residents’ Association, Bekezela Maduna Fuzwayo, said it was shocking how members who desert the opposition suddenly become the ruling party’s ambassadors. “It can never be justified; we don’t know what has come over him (Cross). It has become a trend that members who leave the opposition all of sudden start speaking good about the ruling party. He is eyeing something; very soon we will hear that he has landed a post,” he said. Political analyst Dumisani Nkomo said although this was a clear misuse of funds, it was worrying that the reason behind Mnangagwa’s visit to Bulawayo had been overshadowed by the rancour over the mode of transport used. “I personally don’t condone the misuse of public funds; but I also feel people are now ignoring the real story, the Gukurahundi issue that the president flew here to discuss. For the first time this issue is being discussed openly without fear. People are not talking about what was discussed during the meeting,” he said. The Affirmative Action Group’s Matabeleland Chapter president Reginald Shoko said Cross’ sentiments were justified. “From a macro-economic perspective, Cross was right in saying the president was justified; the national airline is only flying one plane and we cannot expect him to take it off route each time there is a trip,” he said.